Students across Eagle County traded in their pens and pencils for skis and snowboards during Tuesday's snow day. EAGLE COUNTY — Students across Eagle County woke up to a snow day on Tuesday, the third in more than 30 years. 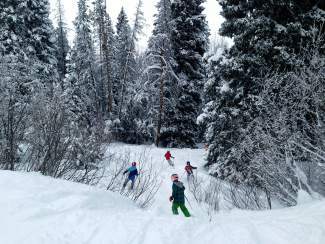 Both Vail and Beaver Creek reported nearly 30 inches in three days, and inclement road conditions prompted Eagle County Schools to shut down for a day, allowing students to enjoy all of the recent powder. “Thank you, Mother Nature, for bringing us a snow day,” said Addison Mandeville, a third-grader at Gypsum Elementary School who was skiing at Beaver Creek with her sister, Danielle, and mom, Casey, on Tuesday. Betty Bartok, a second-grader at Brush Creek Elementary School, was up at 5:30 a.m. on her snow day, ready to not go to school. “I was excited for skiing,” she said. “She was excited for the ‘pow pow,’” her father, Matt, said. Students across the county were trading in their pens and pencils for skis and snowboards on Tuesday. Riding runs like the double black run The Narrows on Tuesday, one group of Eagle Valley Middle School seventh-graders were hard to miss. Friends and neighbors Maddox Rose, 13, Cole Weathers, 12, Jack Eastabrooks, 12, Ty Murray, 13, and Denali Geddes Boyd, 12, said the excitement for Tuesday’s day on the mountain started as soon as the news broke that school had been canceled. “Our entire neighborhood just broke out and started screaming ‘It’s a snow day,’” Rose said. The group rode from open to close. No snow day is complete without hot chocolate and sweets. “I’m looking forward to the Candy Cabin,” said Luke Campanale, a first-grader at Homestake Peak School. “It’s a lot better than school,” said his sister, Stella, a fifth-grader at Homestake. Stella and Luke’s mom, Greta, was with them on Tuesday, an impromptu family gathering. In a place where every day seems like a snow day, students are already looking forward to the next one. “It’s fun. I want more snow days,” said Arden Houck, a sixth-grader at Eagle Valley Middle School who was snowboarding at Beaver Creek on Tuesday with her dad, Mike.